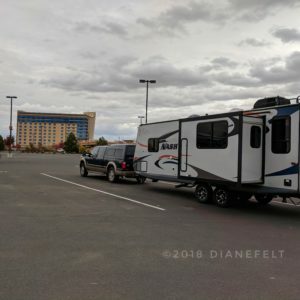 It’s Day #129 of our Speed of Sanity Full-time RVing journey! 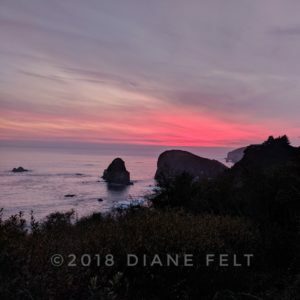 And, it’s time to get everyone up to speed on our Northwest trek that began on Saturday, October 13 and continued through Monday, November 19. We spent those five weeks in parts of Idaho, Montana, Washington, and Oregon. 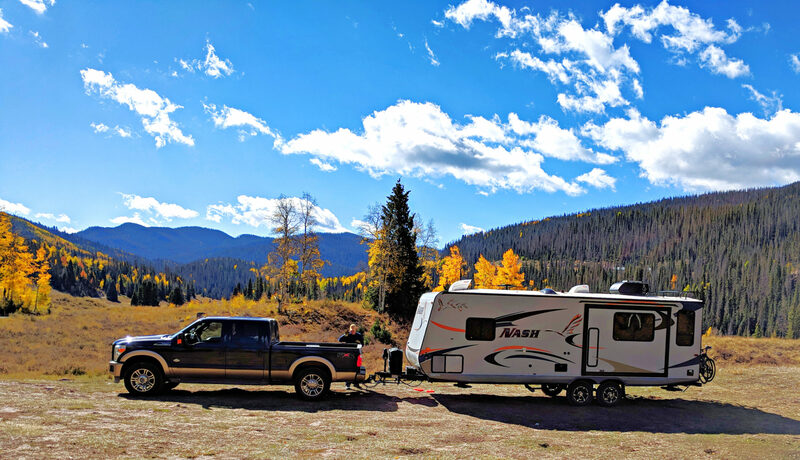 As mid-October approached in the Denver area and the truck issues were resolved, it was necessary to “get out of Dodge” with a winter storm approaching from the north. Overnight on October 12 while at Chatfield State Park in Littleton, Colorado, we slept in the trailer with it already hitched. We simply needed to batten down the hatches at dawn, retract the dinette slide-out, and hit the road just as the sun was rising. Needless to say, it was a relief to head west on I-70, get through the Eisenhower Tunnel, over Vail Pass, and beyond Glenwood Springs, knowing that we escaped the arriving snow and cold snap. We stayed in Vernal, Utah at the Fossil Valley RV Park on October 13 and 14. Vernal is not far from the Colorado border. We managed to arrive with plenty of time to set-up camp and walk to dinner. Once the campground manager learned that we were not considering a visit to Dinosaur National Monument as we’d toured it several years ago, he gave us some great options. Instead we were intrigued by petroglyphs in the area and the prospect of driving on a rugged mountain road. 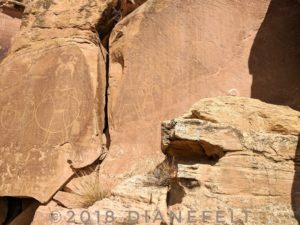 Heading through Dry Fork Canyon, the McConkie Ranch Petroglyphs are on the National Register and a Utah Historic Site. The signage provided: “This is considered to be the type site of the Classic Vernal Style rock art, characterized by elaborately decorated anthropomorphic figures. This style may be affiliated with the Fremont Culture and probably dates to the period A.D. 1 to 1200.” The parking lot and the petroglyphs are on private land, so it was important to respect our surroundings. 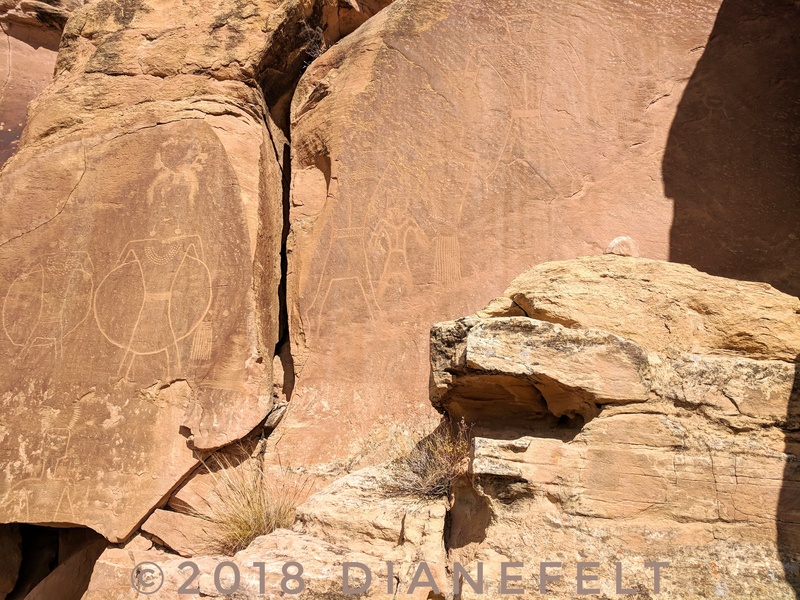 A path took us up towards the canyon walls where we followed it about ½ mile, stopping to appreciate dozens of petroglyph figures and scenes created on the rock face. In our era, we have social media and seemingly instant communication with one another. Standing before the images and considering a distinctly different time and culture, we were in awe. Whether they were creating family portraits, depicting their hunting quests, celebrating the passage of seasons, or providing a warning of dangers in the canyon, this was their way of recording and sharing information. With our picnic lunch packed, we drove onwards to shake, rattle, and roll our way over rugged Red Cloud Loop Road. It was even more so due to the logging trucks that relied on it. 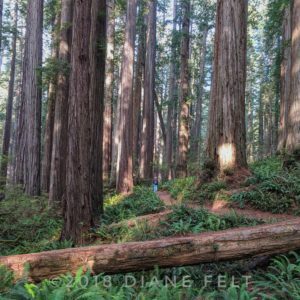 There were large logging operations that were evident. Deep ruts and exposed rocks made it perfect for the pick-up! We wound our way through pine forests and beautiful stands of aspen. We enjoyed a picnic lunch with a view of clouds enveloping mountains as they blew through the valley below and snowflakes dotting our windshield. 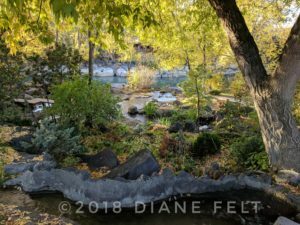 On October 15, we left Vernal for Idaho Falls. There we stayed for three nights at the Snake River RV Park. Idaho Falls had an inviting Greenbelt along the Snake River with tree-lined, paved trails on either side of the river. We walked to and from the RV park twice using the Greenbelt in order to spend time in the public library and also a coffee shop. Families were out for walks, folks were biking, skateboarding, or rollerblading, and photographers were using the river and falls as the backdrop for outdoor portraits. The falls were the centerpiece with their thundering sound and sprays of water. The Japanese garden at the south end caught our eyes as a quiet space to appreciate silent reflection. The public library was large with a very busy circulation desk and the hustle-bustle of children/youth programming. As a former librarian assistant in an elementary school, I really appreciated the variety of programs offered and the cheerful voices of the kids selecting books. We were spoiled at La Vanilla Bean Patisserie with dark-roasted coffee, delicious panini sandwiches, and a chocolate brownie for two that will forever stick with us! It was a quiet place to sit with laptops open for a couple of hours. While in Idaho Falls, we used our Idaho Benchmark Recreation and Landscape Atlas to locate a short hike about 20 minutes away. The hike took us to a viewpoint that gave us a vista of the Snake River valley with advancing autumn colors. Again we awoke early with the trailer situated to easily hitch and go on October 18. We headed north for a full-day’s drive along the eastern side of Idaho to Helena, Montana. We treated ourselves to a Quality Inn hotel stay since the trailer had an 8am appointment at D&D RV Center. Having stayed at this hotel last spring, we knew that it had an ample parking lot that could accommodate 53’ of truck + trailer. We were spoiled with a hotel stay in Helena, Montana. Tranquility, the trailer, had a 6-month check-up at our request. We were planning to be in Montana anyway, so thought it would be helpful to have a once-over of critical systems, especially since we’re using it as a full-time abode. It was great to see all of the D&D RV folks. As it turned out, it was determined that we needed to add an extension to the hitch to give us a more level ride. Otherwise, we were good to go! Off to Bozeman we went to spend time with our friends, Karen and John. The first three days the trailer sat on their driveway with an electric hookup. It was a real treat to sleep inside a house for three nights! The four of us walked in CROP Walk, an ecumenical charity walk to raise funds to help with hunger relief in the U.S. and the world. As always, Karen and John made our stay just like being at home. The morning of October 22, Karen and John hitched up their Lance trailer alongside ours in their driveway. Off the four of us went to Craters of the Moon National Preserve and Monument to camp for four nights. This national park is roughly 20 miles west of Arco, Idaho. We could write a volume just on Craters of the Moon. Suffice it to say that going in October was perfect. The temps were moderate to chilly. It was a bit windy on several of our hikes. But, we escaped the extreme heat that sometimes is unpleasant during summer. The ancient lava flows with their blacks, blues, and terra-cotta oranges were magnificent. Cinder cones, spatter cones, lava flows, and more! It was almost a moon-like landscape. Each day brought new adventures with a variety of hikes. 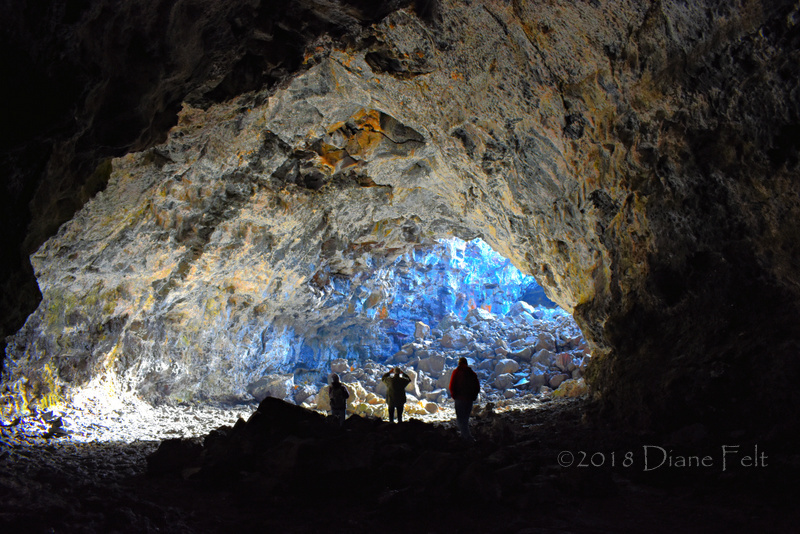 The last day will likely remain quite memorable as we entered lava flows, which were also considered caves. In order to visit the caves, we had to be cleared by the park ranger to protect bats from the white-nose syndrome, which sadly is the demise of thousands of bats across the country. Careful footing, head lamps, and the buddy system are important for entering the lava flow caves. It was fascinating to see what was actually beneath the crust above where we had been walking. Once done with our hikes, it was good to return to cozy abodes, share in meals, and play dice and domino games! One evening we headed to Arco for dinner at Pickle’s Place, a legendary eatery that includes the Atomic Burger that matches the acclaim of the community. In 1955, Arco was the first nuclear-powered city in the world. The Idaho National Laboratory employs many people from the area. Alas, a return to the area would likely include a tour of the lab! Having lived roughly a mile from Fermilab in Batavia, Illinois and Steve having worked briefly as a software consultant at Argonne Lab in Lemont, Illinois, it would be interesting to check out this lab! Yes, RVs may stay for free in the parking lot of the Wildhorse Casino. Due to the length of this post, I will not go into great detail. It was well-lit and secure. RVs were permitted to have their slide-out rooms extended. There were no hook-ups, so we dry-camped. The casino had a fast-food breakfast restaurant where we purchased breakfasts. Free coffee was on tap in the casino. Yes, we dropped $5 in the slots. No, we didn’t come away with one penny. 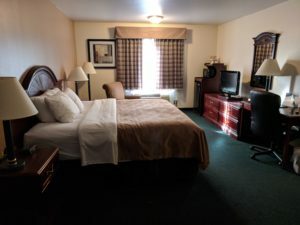 We stayed two nights between our Craters of the Moon stay and our Pullman, Washington stay. 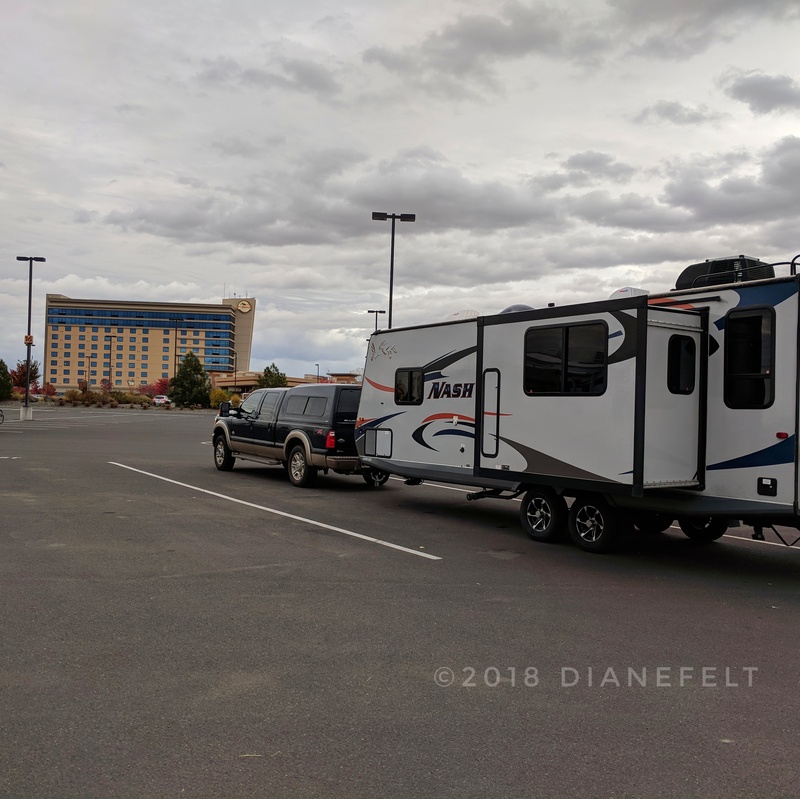 Then we returned to Wildhorse Casino’s lot between Pullman and our Portland, Oregon leg. Many free stays can be experienced at some casinos, Walmarts, Cabela’s, Cracker Barrel Restaurants, etc. It is not a given that they offer parking lot dry-camping. Therefore, it’s important to check with staff before assuming. Absolutely no dumping of the gray or black water is permitted! From October 27 until November 5, we were in Pullman, Washington. Our son, Jeremy, and daughter-in-love, Michelle, live there. The first six nights we stayed at Pullman’s City Campground with full hook-ups. It was a perfect location with a sidewalk that took us to downtown. Pullman is located in the Palouse Region with its many hills. We had a good workout each time we walked to and from their home and the Washington State Campus. We attended two exhibition games on campus: women’s and men’s basketball. It was great fun to watch the WSU Cougs football games on TV and see them advance! We had enjoyable outings, shared in meals, played many games, and soaked up every possible minute with Jeremy and Michelle. We hiked at Idler’s Rest and the college’s arboretum, both with good hills. Once our six days were up at the campground, we moved the trailer to the kids’ driveway. As with our daughter and son-in-love in Denver, it was quite difficult to bade farewell until next time! We visited Portland in 2011 so we were acquainted with its lay of the land along the Willamette Valley. Given the short-notice of this visit, we were relieved to obtain reservations. We had an “island” stay (wink-wink) for four nights beginning November 7. The Jantzen Beach RV Park is located on Hayden Island, which is in the Columbia River between Portland, Oregon and Vancouver, Washington. As it turned out, we had a perfect location for accessing the bus and light rail plus I-5 when we needed it. The highlights while in Portland were time with family and friends! We had two dinner outings with our niece, Mary, and her guy, Tyler. One afternoon we visited a hometown friend of mine, Susan, and her husband, Mike. Time went too fast with all of them though! 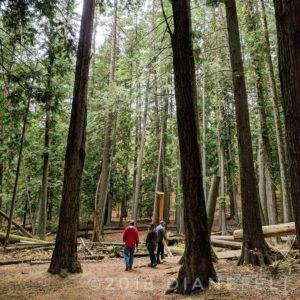 We hiked through Hoyt Arboretum in Washington Park. At a couple of vantage points, we were treated to views of Mt. Hood, Mt. St. Helens, Mt. Adams, and Mt. Rainier. The trees were magnificent and the variety of species quite enjoyable. 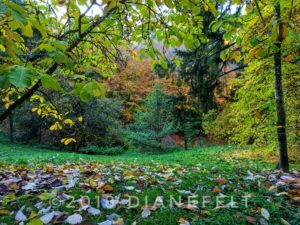 It took us back a bit to the beauty of Morton Arboretum in Lisle, Illinois. A visit to Portland isn’t complete without a stop to browse at Powell’s Books, which claims to be the world’s largest independent bookstore. Since we purged our household of dozens of books earlier this year, we weren’t up for spending top dollar for a new book. Instead we both came away with one used book each. Once we’re done with the books, we’ll donate them to a library. 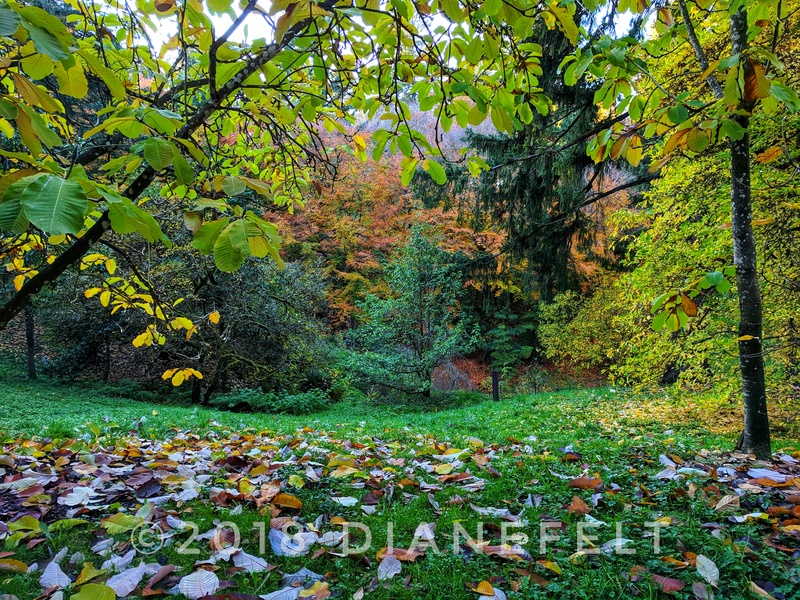 On November 11, we had a one-night stay at Twin Rivers Vacation Park in rural Roseburg. We selected this spot since it was just a 15 minute drive to the home of our Iowa State University college friends, DeWaine and Laura. Of course, our friends provided fantastic hospitality with grilled elk and veggie shish kabobs and ended with yummy ice cream from a local dairy. It had been 13 years since we last saw DeWaine and Laura. In fact, we stayed with them a couple of nights when Steve embarked on his 2005 cross-country bicycle ride. Now, the goal is to see them more often! What can we say? It was ¼ mile from the beach and the Pacific Coast! Again, timing was perfect. We were there from November 12 for a week. Because we were after the high-season, we were able to reserve for a campsite about two weeks out. The campground was never at capacity, but if we return, we’ll still opt to get reservations. 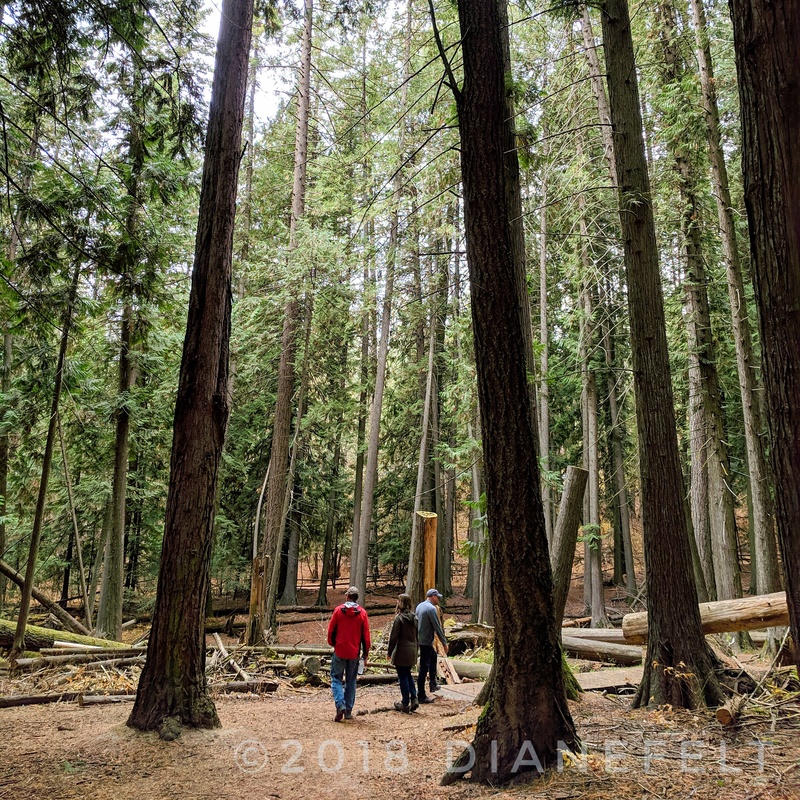 We were tucked back into a Douglas Fir forest. It was beautiful, but the downside was having tree sap drip on the truck and trailer for a week. Next time, we’ll select a site away from the trees! Putting that aside, we focused on beach strolls, beautiful sunsets, sea breezes, and watching the antics of seagulls. The week along the coast gave us a reprieve from an oft-times busier pace that we were keeping. It was quite nice to just “be” and make up the days as we went. Although the reality of the tragedies to the south with the wildfires in Paradise and Malifu, California, were heavy on our hearts. The resulting air quality warnings in California were to impact our next travels. Once we completed the Northwest, our plans were to head to the greater San Francisco area. That my friends will be for the next post when we’ll give you details! (We are in California, so we made it, but with a delay). Thank you for bearing with me on this lengthy post. Believe it or not, we have difficulty finding the time to write posts. I post roughly once a week on Instagram (@speedofsanity), which if you’re so inclined you may also follow. If you would like to receive a notification when we write a new post for 12mph.com, please click on the “Subscribe” button.